I feel that I killed my dog. This is a public blog, and I generally don’t put the really private stuff up here. But this feeling that I killed my heart dog is a quagmire in which I am stuck. Maybe writing about it will help extricate me. Of course, I did arrange to help Cooper die. He was sick with lymphoma, and failing fast. On that last day, he came over to me as I sat on the edge of our low deck, put his head in my open hands, and looked up at me steadily. This was so unusual that I called Russ over, and together, looking at our dear Cooper, we knew it was time to help him leave this life. From the day I got Cooper, I knew that he needed to stay intact (not neutered). At first, this was to allow his bones and joints to grow properly. But later, after he was diagnosed with Symmetrical Lupoid Onychodystrophy, I kept him intact to protect his health. SLO is an immune-mediated disorder, and even though his veterinarians assured me that neutering would have no impact on his SLO, I felt strongly that he needed all the hormones his testicles produced to support his whole system. This became even more important to me when he started treatment for low thyroid. But then we got Carlin, an energetic, impolite, untutored, and rambunctious puppy boy. Carlin wanted so badly to be friends with Cooper, but Cooper was having none of it. He made it clear that he wanted that puppy to go away, and as soon as possible. Cooper attacked Carlin several times, frightening all of us. And once Carlin grew stronger and bigger enough, he attacked Cooper, giving him puncture wounds on the neck. We tried everything: talking to his breeders, getting the dogs checked out by their veterinarians, consulting two behaviorists several times, adding more discipline and impulse control exercises to their training, and even giving them flower essences and homeopathic remedies. We tried keeping the two dogs separated, but this made none of us happy. We also sent Carlin away to a trainer for a couple of months, hoping that he’d mature and things would calm down. But nothing worked. Cooper wanted Carlin to go away. It came down to this choice: find Carlin a new home or get Cooper neutered. Twice I called Carlin’s breeders to tell them that we needed to re-home Carlin. And twice I backed out. Carlin is an affectionate, friendly dog who actually shows some talent for obedience work. He’s beautiful. He’s not the compulsive retriever that Cooper was, and he’s not as good a bird-finder as Tooey, but he hunts and enjoys it, and will make a good hunting dog. I knew that Cooper, and then Tooey, would retire from hunting at some point, and now seemed to be the best time to get another dog ready to fill that role. I couldn’t give Carlin up. So that left neutering Cooper. Just about everyone recommended it, and we didn’t know what else to try. So even though I knew in my heart that Cooper needed to stay intact to support his health, I had him neutered. I satisfied my own wants at the expense of Cooper’s needs. I brushed off the warnings in my own heart, and convinced myself that somehow I could have both. Life is hardly ever like that, where you can have two contradictory things at once. You have to choose. I chose, and based on the depth of my grief and guilt, I can see I made the wrong choice. And I made the wrong choice because I didn’t clearly realize what was most important to me. Carlin would have been happy in another home. I could have gotten another puppy later. But Cooper is my heart dog and cannot be replaced. One piece of advice I got after Cooper died was to start some new activities and traditions. Do something that will make me happy because it makes my dogs happy. Do something that doesn’t carry memories of when I used to do that or go there with Cooper. Sounded like good advice. So, inspired by last Friday’s training day, I went and got an inexpensive, bright orange, kayak. Sunday morning, before it got all hot, we all went to the Sauvie Island dog training area, hoping to find enough water to kayak in. It’s been very hot, and we didn’t get any of our usual June rains. So we weren’t surprised that the usual smaller training ponds were completely dry. But there is a larger lake inside the dog training area that we thought we’d try. Too bad it didn’t occur to me to check out the name of that lake: Mud Lake. Muddy and mucky it was. 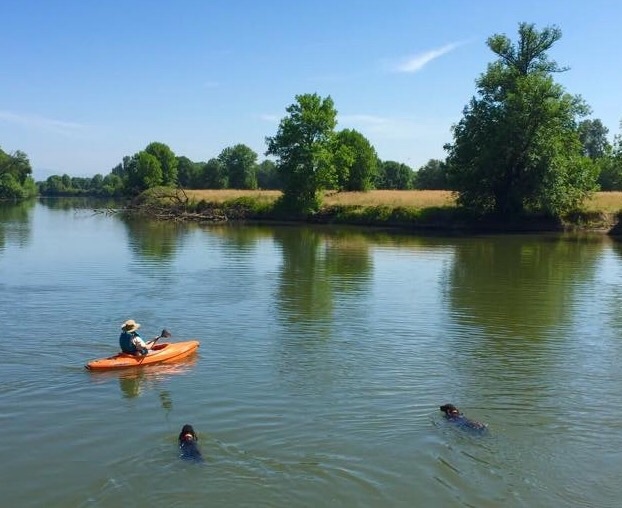 Even though I tried to pole they kayak out several yards to what I hoped were deeper waters, I never did get into waters where I could float, much less where the dogs could swim – in fact, they never got deeper than running through really muddy muck. After just a few minutes, we packed up everything and left. And then Russ mentioned this spot he remembered where we might be able to find some deeper water. So we turned around and found a low bank where we could put into to the river. The river was definitely deeper. When we stayed in near shore, there was an eddy where I could paddle slowly and the dogs could swim. When we got out farther, the current was swift enough that it took some doing to not simply float away downstream. But even so, it was like heaven. Before last Friday, I hadn’t been on a boat for years, and that session was way too short. So on Sunday, floating on the water, watching my water-loving dogs play and swim, run around on the bank, and then jump back into the water — I loved every single second, and they did, too. They both slept soundly all the way home. I hope we can do it again very soon. It has been just too hot to ask Carlin to practice land work, whether it’s quartering down a field looking for upland birds to flush or running out to retrieve a downed bird. For the last couple of weeks, it’s been in the upper upper 90 degrees F, which is hot for any dog. But for Carlin, who seems to be hot even in an air-conditioned room, those temps are just not do-able. We still want to work, though. Normally, Richard, our trainer, does water work during the week, not weekends, so I usually can’t participate. But today I’m in luck. It’s both a weekday and a holiday, I have the day off, and Carlin and I can join Richard for some practice retrieves in the water. Richard does much of his water training on a pond near his regular training grounds. When I got there, what I saw on the shore were kayaks. Kayaks? Turns out Richard uses them to exercise himself and his dogs in hot weather. He gets in his kayak, pushes off, calls the dog to him, and together they go off into the water paddling with paddles and paws. So that’s what we did with Carlin. We worked out the young-dog yahoos by swimming him for about 400 yards, and then went back to the shore to do some water retrieves. The last retrieve was perfect. Richard threw the duck, and I sent Carlin after it. Unbeknownst to Carlin, the duck was alive and swimming, so when he got to the duck, he had to chase it some more in order to get a grip. And a nice grip he got, too, firm and gentle, delivering that live duck unharmed to my hand. Another retrieve excited me, too. Richard kayaked out with a live pigeon, and instead of throwing it, he laid it gently in the water. I sent Carlin out for it, and he picked it up and delivered it, too, as unharmed as the duck. What made that retrieve exciting for me was that this bird had not been thrown, so there wasn’t that throwing-and-flying-through-the-air movement to excite Carlin into action. There were a couple of additional retrieves, not quite as perfect. One time, he didn’t quite swim out far enough to find the partly sunk duck (this one a dead one), and had to be encouraged to swim out farther. A couple of times, upon bringing the bird back, he dropped it at the shoreline and had to be reminded to pick it up again. Once he didn’t come directly back to me, but sort of took this wide detour around me before returning to my side. I got one more thing out of that training day — the idea about kayaks and swimming. Such a cool idea for hot weather. I can see it now — I’m going to have to get myself a kayak. The editors of “Rat Tails”, the official newsletter for the Irish Water Spaniel Club of America, graciously agreed to publish an article about Cooper, our beloved, who died in June 2015.